Last year I got to surf the Mentawais in Indonesia and got one of my best barrel of the 2010. We had 2 solid days of 6-8 ft waves at a spot called Ht's, the rest of the trip was gravy. Beautiful sunsets, perfect waves, and lots of fish! If you ever are considering the Ultimate Surf Trip this is a MUST DO destination! We live on a boat for 10 days/11 nights and surf/dive/fish our brains out. 2011 Indo Season has begun and I'm excited to head back for more barrels, fish, and fun times with a group from Hawaii and hope we score again! Now that the south swells in Hawaii have slowed down, it's time to start chasing some Indo swells. I'll be bringing my camera and taking some photos of the boys so stay tuned! Just in from the 5th Annual Mexican Shootout and it was a BLAST! Lots of FUN, SUN, and Good times again with divers from Hawaii, Seattle, San Diego, & Alabama. The tides and full moon made for strong currents with a thermocline 40 ft below. The waters were changing from cool spring to warm summer so the fish were coming in. Lots of sighting of Marlin, Roosterfish, and even 80# Yellowfin tuna and big Wahoo was taken a few days before the competition. We raised about $600 to support the El Sarjento School with new sporting supplies and the kids came down one evening to perform a dance for our group. Its a great feeling to catch fish for a good cause. Tim, Karon, and Jimena Hatler do an excellent job every year. We had a host of great sponsors who generously donated prizes for the event and we were so thankful for their support! Prizes to our Captains, Teams, and Individual awards were given out and appreciated by all. Team "Revolu-Sun" Puna Apio and Ernie Ripley took first place this year and their strategy paid off and the end. Congratulations you guys! Ken Oakes also nailed this huge trigger fish weighing in almost 10 lbs winning the target reef fish! I was hoping for one nice fish and got lucky at the end of trip with this sailfish that came in a little to close to my speargun. Palapas Ventana is the place to land a billfish and all sorts of fish we don't have in Hawaii so I can't wait for next year! 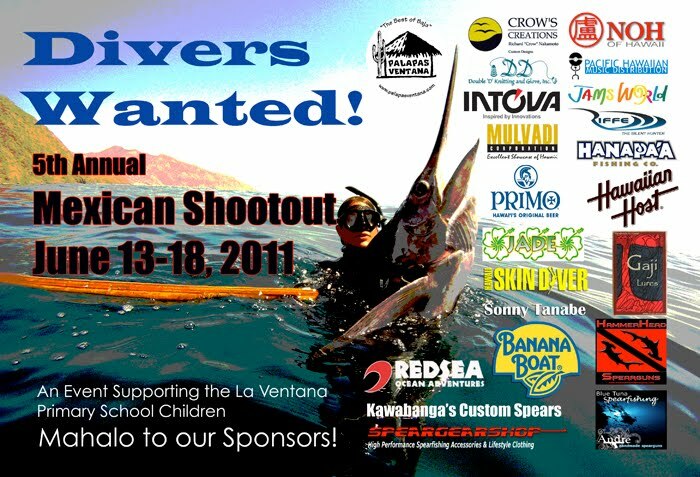 Thank you to all our divers, boatmen, sponsors, and Palapas Ventana Ohana for making it another successful event! Make plans to join us next year! 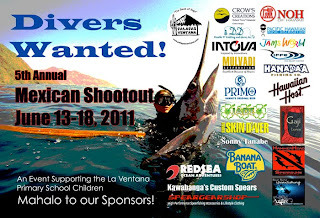 Every year we team up with Palapas Ventana to host a fun dive tournament in La Paz Mexico. We have a great team of sponsors who are very generous to support the event and welcome divers and non-divers to join the fun for a great cause. If you are interested in joining us send me an email: redsea@hawaii.rr.com. Saturday Morning "Dawn Patrol Crew" anxiously waiting for the new swell. Looks like about a dozen surfers out already. Call me when it comes in...back to zzzz.